UberScoot Has Raised The Bar ... Again! The Uberscoot 1600 watt is the most powerful electric scooter we sell. Over 2 hp. There won't be a hill you can't conquer! The EVO/UberScoot 1600 continues the legacy of superior engineering the EVO name pioneered. Quality components all the way through. Tight, hands on quality control throughout the manufacturing process delivers an electric scooter that does what it's supposed to do .... when it's supposed to do it. The UberScoot 1600 is designed for mid teen and adult riders. 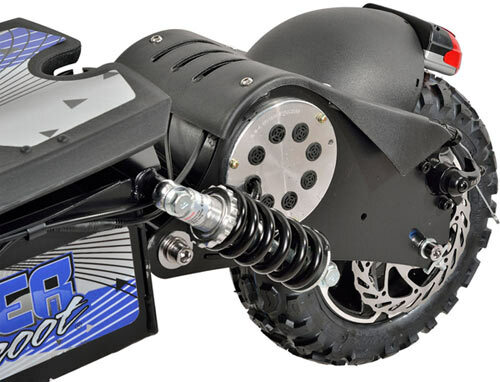 The UberScoot 1600 watt motor will handle heaver riders with ease. Built for everyday use. This Scooter Will Not Disappoint! Five inches longer than our UberScoot 1000 watt scooter the UberScoot 1600 watt has plenty of room for the largest riders. The longer wheel base works with the 1600's suspension to provide you with one of the most solid, well balanced ride available on a sport style folding electric scooter. This amazingly powerful electric scooter can be ridden standing or seated. Quick remove seat is wide, has springs and is fully adjustable. Real disc brakes with vented rotors front and rear. Tough ABS deck resists damage. Deck lifts from rear for easy access to main fuse, batteries and scooter electronics. UberScoot 1600 MX style handlebars are loaded with options. Control the integrated front and rear lights. The 1600 comes with a keyed ignition that helps prevent unauthorized use. More options like the "Power Interrupt Feature" Squeeze the rear brake lever and the on board computer automatically "interrupts power to the scooters motor increasing safety in quick stopping situations. UberScoot's electronic twist throttle, "tells" the scooter's systems what the rider wants to do. Throttle position is monitored and analyzed hundreds of times per second by the controller/computer which then provides the exact amount of energy needed. No wasted energy pulses. No surging at constant throttle. LED battery charge level indicator keeps track of your batteries power level and can perform certain diagnostic functions. Handlebars can be loosened and rotated forward or backward to meet your personal comfort requirements. There's More! The UberScoot 1600 watt 48 volt electric scooter features an economy mode button. This mode will slow down acceleration and top speed to conserve battery life for those long rides. Power reduction mode is also very helpful for an entry level rider. Control button is conveniently located next to throttle. Thumb operated. To return to full 1600 watt power mode simply press the button at any time. 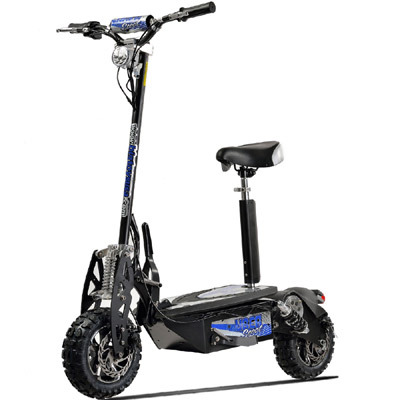 The Uberscoot 1600 watt motor is made with rare earth magnets, high intensity brushes, and superior bearings. Motor overheat protection is built in. At full battery charge this motor develops over 2 hp. A remarkable achievement in such a small, quiet package. One piece, all steel rear trailing arms provide superior stability on all terrain. Tough, one piece ABS motor cover and rear fender adds style and protects rider from water or mud. Fender has welded steel brace under making this area extra strong. Bright, multi bulb LED Tail/Brake light included. Fully active and easily adjustable suspension can handle riders of different weight or changes in riding surfaces. Shocks are located to "flex" directly under the rider seat greatly improving rider comfort. Upgraded, larger drive chain to handle the increased power and torque. The UberScoot 1600 watt electric scooter is great for urban commutes or backwood trails. Large 12 inch, Pneumatic, Duel Sport Tires. Knobby tread design enhances off road capabilities and hard surface traction. Real Light Electric Vehicle (LEV) tires meet or exceed all safety specs. for their classification. These robust tires absorb shocks and road hazards better and have a higher resistance to lateral forces. Whether it's jumping a curb in the city or taming a dirt road these tires out perform the competition! Stylish "spoked" cast aluminum alloy wheels are super light and super strong. Easiest fold and lock system in the industry. Can be folded or unfolded in under 5 seconds. Your new UberScoot 1600 arrives at your door encased in fitted foam and placed inside of a thick cardboard shipping container ensuring your new UberScoot 1600 electric scooter arrives in new condition. Your new UberScoot 1600 arrives at your door 99.9% assembled! Unfold the scooter. Place handlebars on to steering down tube and tighten fasteners. Insert one of the main fuses that came with your UberScoot 1600 into the fuse holder located under the foot deck. Affix front and rear lights (fasteners included) and plug them in. Assemble seat to post and place onto support receptacle at rear of deck. A handy tool kit is included. Motor overheat protection built in. Top Speed: Let's just say it's up in the "spooky fast" range. Charger Included: Yes. 48 volt. Uses regular household electricity. Pennies a charge. Brake power interrupt feature. When rear brake lever is pulled this feature "interrupts" the power to the motor for safer stops. Multi-Function LCD Indicator: Located on handlebars, tells you the status of your batteries while riding. Click the button below to add the UberScoot 1600w 48v Electric Scooter to your wish list.